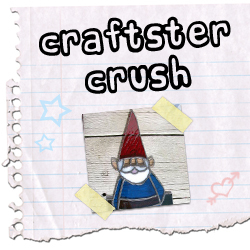 This month, our Craftster Crush is AlwaysInspired! You might recognize AlwaysInspired from her many poppets and other toys but she’s so talented, she can post around many different boards! She’s done close to 40 swaps, she’s a quilter, a glass maker, a painter, and embroiderer. Whew! Here’s a peek at AlwaysInspired’s Craftster portfolio, but be sure to check out all of her topics for even more AlwaysInspired creations! Here are some random crafty facts about AlwaysInspired! Not only is she great at quilting and sewing and art and embroidery and using glass, she also makes some amazing papercrafts! She made a Cold War quilt! Her garden is full of mushrooms. She had a very large thyroid. Not only did she embroider her own blog header but she made kittykill’s as well! Thanks for being a part of Craftster, AlwaysInspired! We you. I love my bestie, AlwaysInspired. Seriously, this gal can do ANYTHING she attempts (except knit or crochet, dammit!) I am thrilled to know her as an artist, and honored to call her my friend. Awwwww thanks everyone! I’m honored! I love craftster!